A cutscene from the past, or time travel? That is awesome! I do hope that they flesh out a more interesting story and begin to evolve the games into having deeper plots and storylines. I'm definitely picking this one up for PS4. Wonder if the people behind Mega Man 11 watched/read Atom: The Beginning right before this project. Considering how thematically synonymous Mega Man is with Astro Boy, that wouldn't surprise me. I thought so too. This is so awesome!!! Mega Man is barely like Astro Boy after a point. Rock himself and his origin slightly is the only tie that resembles Astro Boy. Also people keep spreading this myth that Mega Man started off as Astro Boy then lost a license or that it was admitted somewhere that it was directly inspired by Astro Boy therefor making it a knockoff (just speaking in general not saying anyone here said this), but that is all hogwash and made up by fans with no source whatsoever. 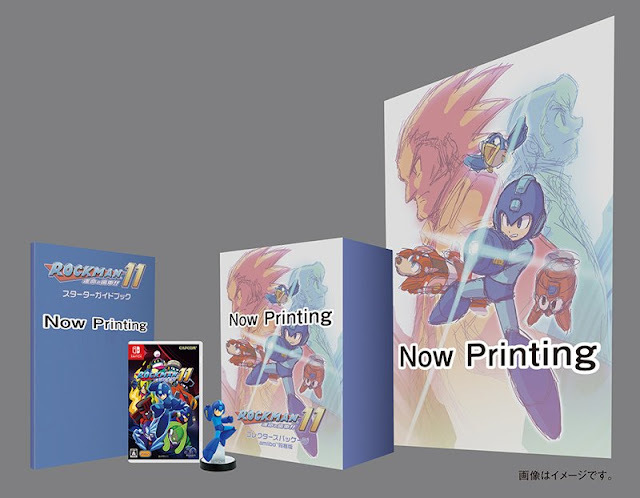 Capcom has expressly stated very clearly that Mega Man was always supposed to be an original IP and the creators of Mega Man have stated time and time again that Mega Man was inspire by GENERAL ANIME AND OTHER SERIES GENERALLY ranging from Sentai to Mecha cartoons preceding it (like Gundam) in terms of design, it was even admitted to be inspire by super hero comics (Elecman) to an extent straight from the mouth of the creators. Meanwhile Astro Boy was admitted to be heavily inspired by a crude Pinocchio stripped down to his shorts admitted by Tezuka himself and while no official source for this exists is a blatant mix of that and super hero comics like Superman. There are infinitely more parallels between Mega Man and Sonic the Hedgehog but despite blatantly showing this officially through crossovers and stuff fans STILL have nothing better to compare Mega Man to than Astro Boy, Astro Boy has more in common with My Life as a Teenage Robot than with Mega Man, yet the idea of a My Life as a Teenage Robot style storyline for a Mega Man series is stomach turning to most Mega Man fans, yet will fit like a glove for Astro Boy. I know it seems like I'm mad and ranting but I'm actually just talking friendly and about a topic it just takes a long time to explain some things. For whatever it's worth thank you for taking the time to read this in a friendly way to whoever reads this. Roll is also a lot like Uran as well, except Uran is a lot more creeper... Other than that robot boy in seemingly underwear with boots that uses an arm cannon (which I don't think was Astro's primary weapon I think he had an ability for every major body part) with an old white haired Dr. looking after him are the things that make people compare them. Parallels in other franchises (like Casshern) are more subtle not as upfront and obvious. Although I think Light and Wily were inspired by Einstein and Darwin but in Darwin's case they took creative liberties and he ended up looking like Santa Claus then they tried again with Cain. That is my theory at least. Wow Anon, no need for a massive dissertation. It honestly sounded like you were mad and ranting, no offense. @Kitchen Staff: How do people sound when they don't make a sound? Did you just say... MLAATR? Don't be a wiseass, Anon 5. That's very interesting. Only the Ruby Spears cartoon ever attempted to show those two in their youth. Anon 1: You don't have to be a snot about it by saying "Wrong" like that. He probably hasn't read the Archie comics or Ariga's manga. Anon 2: Truthfully I have read Ariga's manga, it's just been a long time since I did. I'd forgotten all about it. Can't wait to play it, up Rock! I'm really hope a great soundtrack too. I love how Light is similar do Rock, this makes sense if you consider that he built him as his son. Just a tip Air Man got a costume in SFV and it looks pretty cool.